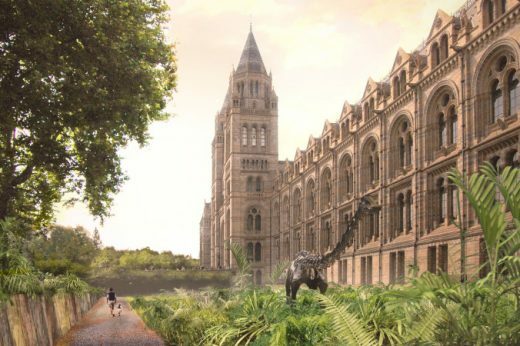 Proposals to transform the surroundings of Alfred Waterhouse’s Grade I-listed Natural History Museum have been lodged with the Royal Borough of Kensington and Chelsea, reports the Architect’s Journal. 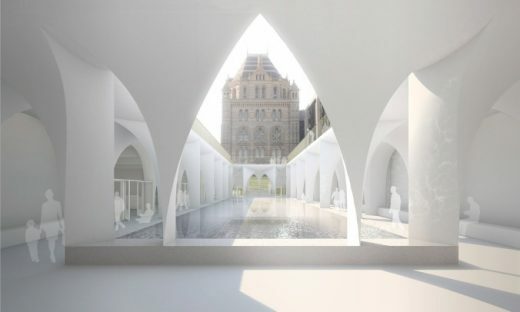 The NHM enjoys a generous landscape setting, with the most extensive open space of any of the London’s national museums, reports Níall McLaughlin Architects. 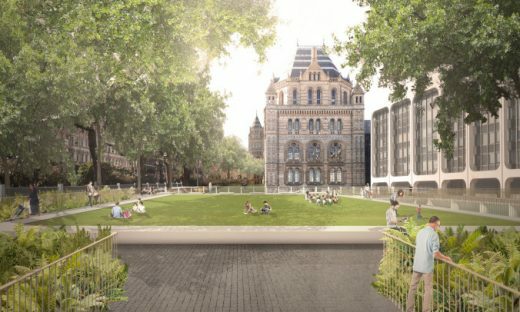 In partnership with Kim Wilkie, we have won the competition to re-imagine the entrance grounds of the museum and create a new civic public realm, a key part of which is improving the visitor experience for the 5 million visitors the Museum welcomes a year. The project seeks to create an innovative setting that matches the visual excellence of the world famous Waterhouse building and Darwin Centre. A new approach and entrance sequence will provide a more integrated visitor experience and re-link the museum with the immediate vicinity of the newly pedestrianised zone of the Exhibition Road cultural quarter. The Natural History Museum in London is a museum exhibiting a vast range of specimens from various segments of natural history. It is one of three large museums on Exhibition Road in South Kensington, the others being the Science Museum and the Victoria and Albert Museum. The Natural History Museum’s main frontage, however, is on Cromwell Road. The museum is home to life and earth science specimens comprising some 70 million items within five main collections: botany, entomology, mineralogy, palaeontology and zoology. The museum is a world-renowned centre of research specialising in taxonomy, identification and conservation. Given the age of the institution, many of the collections have great historical as well as scientific value, such as specimens collected by Charles Darwin. The museum is particularly famous for its exhibition of dinosaur skeletons and ornate architecture, both exemplified by the large Diplodocus cast which dominates the vaulted central hall. The Natural History Museum Library contains extensive books, journals, manuscripts, and artwork collections linked to the work and research of the scientific departments; access to the library is by appointment only. Although commonly referred to as the Natural History Museum, it was actually officially known as British Museum (Natural History) until 1992, despite legal separation from the British Museum itself in 1963. Originating from collections within the British Museum, the landmark Alfred Waterhouse building was built and opened by 1881, and later incorporated the Geological Museum. The Darwin Centre is a more recent addition, partly designed as a modern facility for storing the valuable collections. Like other publicly funded national museums in the United Kingdom, the Natural History Museum does not charge an admission fee. The museum is an exempt charity and a non-departmental public body sponsored by the Department for Culture, Media and Sport. The Natural History Museum has an ornate terracotta facade by Gibbs and Canning Limited typical of high Victorian architecture. The terracotta mouldings represent the past and present diversity of nature. The foundation of the collection was that of the Ulster doctor Sir Hans Sloane (1660–1753). Richard Owen was appointed Superintendent of the natural history departments of the British Museum in 1856. His changes led Bill Bryson to write that “by making the Natural History Museum an institution for everyone, Owen transformed our expectations of what museums are for”. Both the interiors and exteriors of the Waterhouse building make extensive use of terracotta tiles to resist the sooty climate of Victorian London, manufactured by the Tamworth-based company of Gibbs and Canning Limited. The tiles and bricks feature many relief sculptures of flora and fauna, with living and extinct species featured within the west and east wings respectively. This explicit separation was at the request of Owen, and has been seen as a statement of his contemporary rebuttal of Darwin’s attempt to link present species with past through the theory of natural selection.